Tired all the time? It could be your Mitochondria. 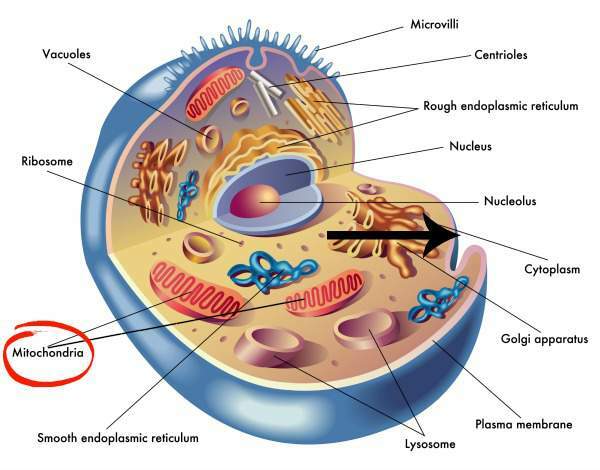 Do you remember your high school biology class when you learned about the structure of the animal cell? Do you recall the sausage-looking organelles in the cytoplasm called the mitochondria (singular mitochondrion)? They are responsible for the conversion of food to usable energy in the form of ATP. The mitochondria are called the “powerhouses of the cell”. I bet you had no idea that your high school biology class would actually become something very useful to you! It could explain why you are so darn tired all the time. You have tried every different type of thyroid replacement. You’ve checked your Free T3, Free T4, and reverse T3. Everything looks good, but you are still exhausted, can’t lose the weight, and are dealing with constant brain fog. The answer could lie deep within all of your cells. We all inherit something from our mothers called mitochondria. (Yes – something we really can blame our mom for.) Mitochondria are these little organelles that exist inside every cell in the body, and they are responsible for doing an incredible amount of work, most importantly creating energy. Yes, mitochondria literally are our life force. Just like a plant creates energy from water and the sun, our mitochondria create energy from oxygen and the food that we eat. We inherit our mitochondria at birth and the quantity and quality are dependent on our maternal ancestor’s genes. Every minute of every day, mitochondria are taking in the breakdown products of fats, carbohydrates, and protein and through a series of complex pathways to create something called ATP, or cellular energy. In fact, the more metabolically active an organ is, the more mitochondria they have. This makes our heart, brain, liver, and muscles the most densely populated organs. Mitochondria, however, do have a Kryptonite – this comes in the form of free radicals that are created during energy production. You can think of mitochondria as little furnaces which create a lot of warmth and energy but in the process release dangerous chemicals as by-products. These “free radicals” end up damaging the mitochondria itself, especially if we don’t have adequate anti-oxidants on hand to protect them. And if our mitochondria are damaged, all of our cells including our thyroid and other hormone producing cells are not going to be performing optimally. To make matters worse, the converse is also true. Triiodothyronine (T3) is one of the most important regulators of mitochondrial activity. It actually flips the switch – turning on the mitochondrial energy machine. 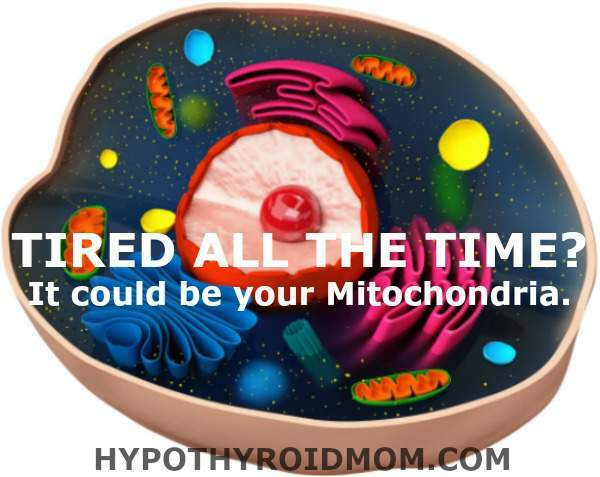 When we are hypothyroid or not converting our T4 to T3 very well, our mitochondria slow down and we don’t have as much energy to use. On the other hand, if the mitochondria within the thyroid are not working well because of high amounts of free radicals and a lack of anti-oxidants, then the amount of thyroid hormone produced plummets. Even if you have a good amount of T3, your mitochondria may be damaged from toxins, chronic stress, medications or lack of protective anti-oxidants. It’s a vicious cycle. Basically, the health of the thyroid gland is dependent on good mitochondrial function and mitochondria are dependent upon T3 to keep it turned on and creating energy. So what can you do to optimize the health of your “powerhouses of the cell”? These are some things that I recommend to all my hypothyroid patients who I think may be dealing with mitochondrial dysfunction. As I said mitochondria are very susceptible to free radical damage and undue stress, so the first things you absolutely must do are lifestyle interventions. Sleep. You can’t skimp on this, so no burning the candle at both ends. Aim for 8 hours a night, even if you have to set an alarm to go to bed to make sure that you get it. Pack your diet with extremely nutrient dense foods. As the physician/researcher and recovering MS patient Terry Wahls says, “Aim for 9 cups of fruits and vegetables per day.” I emphasize eating from the rainbow as well, so include fruits and vegetable of every color in your daily diet. This will ensure high amounts of vitamin C and other antioxidants. In addition, make sure that you are avoiding excessive carbs, any sugar, and any processed food, which tax your mitochondria. Add in oily fish such as sardines, mackerel, and salmon several times a week for more Omega-3 fatty acids, and try to get some nutrient rich organ meat such as liver at least once weekly. Avoid any and all toxins so your mitochondria don’t have to work any harder than they have to. This includes drinking only filtered water, avoiding any second hand smoke, excessive alcohol, and removing all toxic chemicals from your household and beauty products using the Environmental Working Group (EGW) guidelines. Exercise daily. People with a daily exercise regimen have a greater density of mitochondria in their cells. In fact, doing HIIT (high intensity interval training) in addition to lifting weights has been shown to really boost mitochondria. If this is hard for you at first because of fatigue, build up slowly with less intensive activities and build up over several weeks or months time. Be careful not to overdo it. Intermittent fasting and ketogenic diets – This is an area that I don’t recommend at first when people are really fatigued or sick as it can be too stressful to the adrenals. However, there is a lot of data that show keeping to a higher fat/low carb diet along with intermittent fasting really boost mitochondrial density and health. I would try this only after all the other lifestyle issues are in place and you have been supplementing for several months. These are some supplements that I use with my patients to supercharge their mitochondria while they are healing. I usually recommend 4-6 months of supplementation to see how they are feeling. I have some brands that I prefer and I’ll include links below. Be sure of course to discuss supplements with your doctor. CoQ10 – Probably the single most important free radical scavenger in the cell. It protects the mitochondria from damage and actually helps the cell make ATP (energy). It’s especially important to take as we age and if you take any statin drugs which deplete CoQ10. The most absorbable form is Ubiquinol which is best taken with a fat containing meal. Start at 100 mg up to 300 mg. There is a great product called Qunol Liquid CoQ10 (in orange pineapple flavor) that my patients really like and it’s highly absorbable. R-alpha lipoic acid – This is a powerful antioxidant that protects the mitochondria, but also works with B vitamins to more efficiently convert carbs, fats and protein into fuel. It also helps regenerate 2 other major anti-oxidants – vitamin C and E. Take 600 mg daily. A good brand that is widely available is Jarrow Formulas R-Alpha Lipoic Acid . D-Ribose – This is a very special 5 carbon sugar that helps make up ATP or energy in the body. Taken as a powder it helps directly fuel the energy pathways in our most vital tissues such as heart, brain, and muscles significantly improving fatigue. Take 1 scoop (2 grams) up to 3 times daily. For D-Ribose powder I use Douglas Laboratories Corvalen M D-Ribose almost exclusively. It’s a great product. N-Acetyl Cysteine – One of the building blocks of our bodies’ master antioxidant Glutathione, but less expensive and more highly absorbed. NAC supports detoxification pathways as well as acting as an antioxidant in the mitochondria. Take 600 -800 mg daily. I use NAC (N-Acetyl Cysteine) by Pure Encapsulations . Pyrroloquinoline Quinone (PQQ) This is a powerful co-enzyme that not only protects the mitochondria from damage, but also can also stimulate growth of new mitochondria. Start with 20 mg daily. A good brand is Jarrow Formulas Pyrroloquinoline Quinone . Acetyl-L-Carnitine – This is a substance that shuttles long chain fatty acids across the cell membrane into the mitochondria. It literally allows us to effectively use fat as fuel. It is found predominantly in animal products such as red meat and whey protein so vegans may be deficient. Dosage is 500 mg once or twice daily. Lack of carnitine may hinder weight loss, but over usage of Acetyl-L-Carnitine may interfere with thyroid hormone, so testing for Carnitine levels before supplementation is recommended. Acetyl-L-Carnitine can be expensive but I find Pure Encapsulations Acetyl-L-Carnitine is well priced. I also love Designs for Health. Their Mitochondrial NRG is a great all in one supplement containing a little D-Ribose, L-Carnitine, CoQ10, and Alpha Lipoic acid. I start with 2 tablets twice daily. In addition, I highly recommend getting an Organic Acids Test if you are concerned about fatigue that has not improved with thyroid intervention. These labs will evaluate detox, neurotransmitter, energy, and mitochondrial pathways which will elucidate whether these areas need to be addressed. Dr. Heather Moday received her MD from Tulane Medical School in New Orleans, LA. She completed a residency in Internal Medicine and a fellowship in allergy and Immunology. She completed a fellowship Integrative Medicine with the Arizona Integrative Medicine program and is board-certified in Integrative and Holistic Medicine. She completed her functional medicine training with the Institute for Functional Medicine and the Kalish Functional Medicine Fellowship. She is the Medical Director of The Moday Center for Functional and Integrative Medicine in Philadelphia. I also had a hysterectomy in my early 30’s now I’m 59 and I also had my left thyroid removed! I started to feel really tired about 3 mouths later. After the thyroid was taken out I’ve gained 15 pounds since then!!! I have had my blood work done for my TSH levels and the Doc said everything is fine. I know that I never felt so tired before they took half of my thyroid!! I was just put on high blood preasure meds! My blood preasure was fine before they took half of my thyroid! What ever you do alway’s get a second opinion before you let any Docter remove your thyroid because there is so many docter’s out there that do not know enough about the right TSH levels!! trust your gut. There IS something wrong with your thyroid…it’s not in your head. After YEARS of having my concerns fall on deaf ears, I switched to a doctor of functional medicine. They ran the most complex set of tests I’ve ever seen….which resulted in finding some serious issues that my previous endo’s overlooked because I just needed to “watch my diet and exercise more”. The doctor switched me to Nature-thyroid and gave me lots of supplements and a copy of the Mito diet…which is designed in line with the info in this article. I haven’t started the diet yet, but I’ve cut out most sugar – which in combination with the nature-throid — has made a HUGE difference in my energy levels and my weight. There’s hope out there. Don’t settle until you find a doctor who thinks outside the box!! The Designs for Health supplement Mitochondrial NRG is no longer being sold. Is there a similar product you can recommend? Hi. I have had to live wth Hypothyroid for most of my life since I was 20 yrs old. I’m now 54. Recently, I noticed my energy level has really gone down. I tried different supplements, mainly multivitamin but seems my energy continues to go down hill. Iread about the Mitochondria and the supplement you’ve suggested for clients. I’m very much interested rebooting my sapped energy. Please respond. Kathy, Did you try it? Or has anyone tried it lately, that has Hypothyroid? Chronic fatique?